If you are interested in short-term trading such as day trading based on technical analysis, then you would have probably heard about the Williams %R indicator. Pronounced as Percent R, the indicator was invented by famous technical analyst and charting enthusiast Larry Williams. 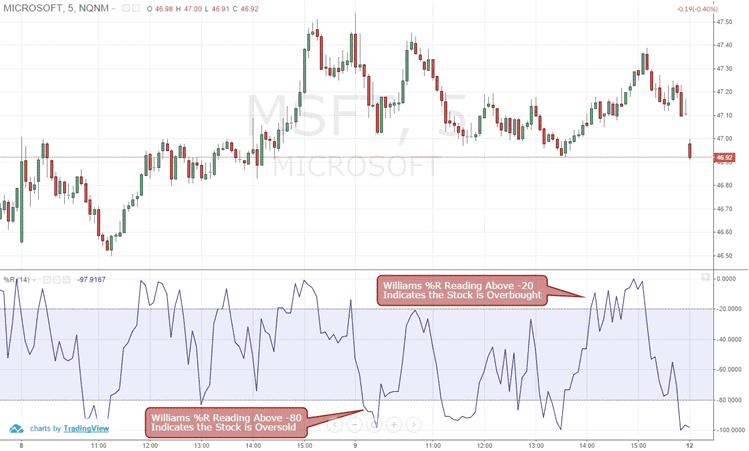 The Williams %R is essentially a momentum indicator, which gauges if a particular stock is overbought or oversold in order to identify the possibility of a counter move. 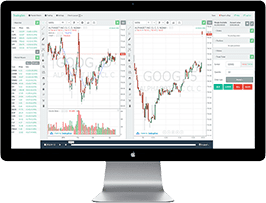 In this article, we will discuss additional methods you can incorporate the Williams %R indicator in your strategies in order to successfully day trade the market. Like most other technical indicators, you can probably find the Williams %R in your favorite charting package. 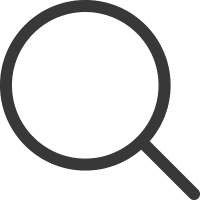 While you do not need to calculate the raw values by hand, there are many good reasons why you should probably thoroughly understand the Williams %R formula. It is always a good idea to pay attention to how a technical indicator generates its signals as you are about to risk a lot of your hard earned money based on its signals. In this formula, the highest high would be the highest recorded price of the security for the number of time periods you are calculating the Williams %R. On the other hand, the lowest low would be the lowest price during the same period. The close in the formula represents the closing price of the last bar or time period. This is why professional traders recommend that you should always wait for the bar to close before considering a signal generated by the Williams %R indicator. During extremely volatile market conditions, the closing price can change quickly and the signal can reverse after you have placed an order. When you add the Williams %R in your charting package, the indicator settings would usually allow you to set the number of periods. The n in the formula would the number of bars or time periods that you are calculating the Williams %R. No discussion about the Williams %R would be complete if you do not compare the indicator to the Stochastic Oscillator. Before we discuss further, let us take a quick look at the Stochastic Oscillator formula. While there are two variants of the Stochastic Oscillator, the formula above is for the Fast Stochastic Oscillator. As you can see, the Williams %R is the inverse of the Fast Stochastic Oscillator. The Williams %R indicator represents the level of the closing price by comparing it with the highest price in the number of periods you are calculating. By contrast, the Fast Stochastic Oscillator represents the level of the closing price by comparing it with the lowest price for a number periods. You may have noticed the Williams %R multiplies the formula by -100 where the Stochastic Oscillator multiplies the formula by 100. Once you multiply the %R value by negative 100, the outcome would be the same as the %K, right? However, if you pay attention to the Stochastic Oscillator and Williams %R charts in Figure 1, you will notice that the scaling values are different. The Stochastic is oscillating between 0 and 100, but the Williams %R is oscillating between -100 and 0. Besides this, the %K and %R lines are the same! As we mentioned earlier, Larry Williams plotted the %R on a 10-day period and he considered the market to be oversold when the %R reading came below -80. On the other hand, when the 10-day period %R came up above -20, he considered the market overbought. 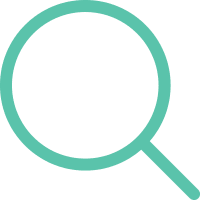 However, it is important that when the market becomes overbought or oversold, it does not directly imply that you should open a short or long trade, respectively. During a strong uptrend, the stock can remain overbought for a long period of time where the Williams %R would fluctuate around -20. In contrast, during a strong downtrend, the Williams %R may move around -80 and constantly show an oversold condition. In both cases, you would end up taking a counter trend position and lose money faster than you can count it. The Williams %R Indicator can be a very powerful tool if you know how to use the indicator properly. Instead of using the indicator for simply identifying overbought and oversold market conditions, you can develop a trading plan around the -50 line cross. After becoming overbought and oversold, if the Williams %R crosses the -50 line, it generally indicates a shift in momentum. At this point, you can start to look for opportunities to trade the stock in the direction the %R crossed the -50 line. 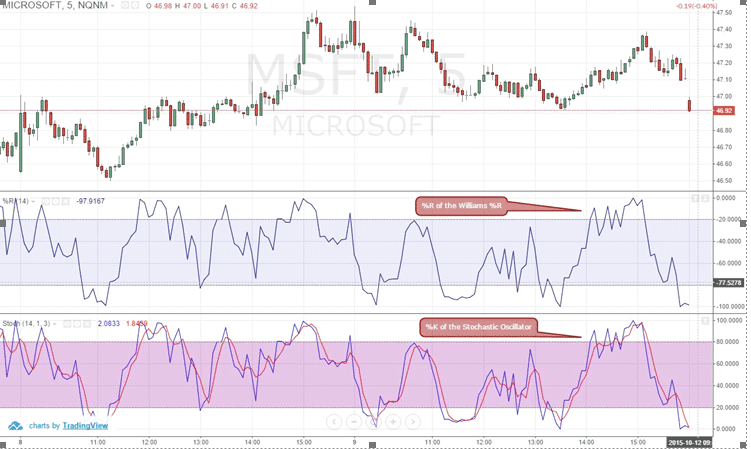 In the example trade illustrated in figure 3, the %R of MSFT was overbought, then the stock price started to decline and the %R crossed below the -50 line quickly, before the bulk of the bearish move happened. Once it crossed below -50 and you waited for the bar to close, you can simply place a sell order. However, we recommend that you try to combine price action with this Williams %R trading strategy in order to increase the odds of your success. As you can see, the bar that pushed the Williams %R reading below -50 was a bearish outside (BEOB). If you simply placed a sell stop order below the low of this bar, you would have entered the market when the bearish momentum was at its highest. Hence, you could have gotten away with placing a smaller stop loss, which would in turn increase your risk to reward ratio on this particular trade. You can use this same strategy to take a long position when the %R crosses above -50 from after being oversold for some period of time. If you have any questions about how to incorporate this Williams %R strategy into your existing trading plan or you have an idea about improve it, please feel free to share it with us in the comments section. If you are familiar with divergence then you can use the Williams %R divergence to confirm if the price of the stock is going to continue trending in the current direction or would it likely reverse directions anytime soon. Williams %R divergences are very powerful you should pay attention to these when it happens. In figure 4, you can see the AMGN stock price formed a down trend, but the Williams %R highs formed an uptrend in the chart. This kind of divergence suggests a trend continuation. 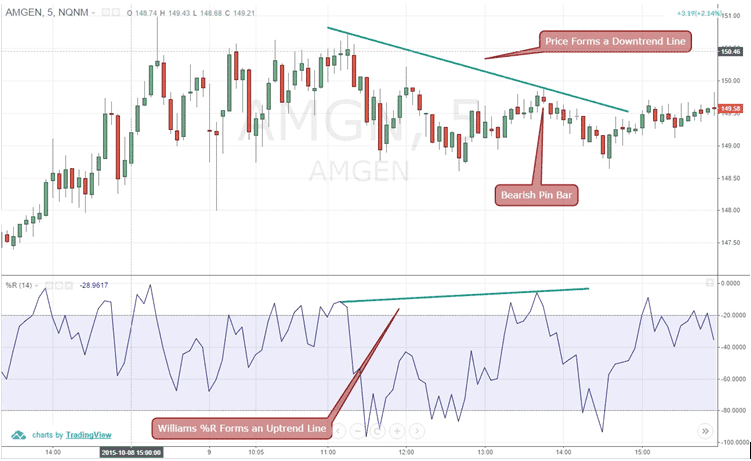 As you can see, after forming a bearish price action bar, the AMGN price shortly resumed the downtrend and you could have easily placed a sell stop below the bearish bar to capture this short swing. Since Williams %R lines are similar to the Fast Stochastic Oscillator, you can simply use the Stochastic Oscillator. But, remember that the intended trading strategy of the Williams %R is completely different compared to the Stochastic Oscillator. Like other momentum indicators, Williams %R has its flaws, as it can remain extremely overbought during an uptrend and vice-versa. 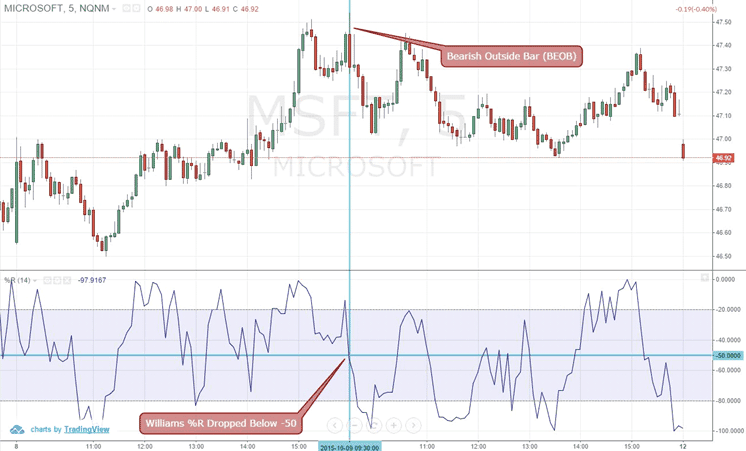 However, as we showed here, you should not use the Williams %R to blindly take a position in the market based on its overbought and oversold readings. Instead, if you trade smartly by combining price action and use the Williams %R to confirm the momentum in the market, your chance of ending up with a profitable trade would increase tremendously. I am from India. I keep close watch on William R. it very nice indicator. Please tell me which indicator is require to support / confirm william R movement. Please guide. Hi Ali , the previous 3 perdios means what the signal was each of the last 3 perdios. Let us say you are using a 1 Day time frame. 1 period back will give you the signal 1 day ago, 2 period back the signal 2 days ago,etc.This is to allow you to see how the signal changes over time and make comparisons. Hi Al, have been following the content in your web page since i heard about the williams %R. 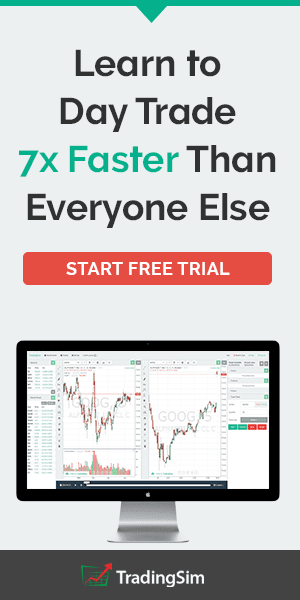 Is this strategy best traded on longer time frames, daily, weekly etc, also what would you suggest for an exit signal – 2:1 risk reward, taking profit at previous high or low – support or resistance. The seems to be alot of teachings about using this strategy going long or short based off the 200EMA as a trend guide.